Resetting the adaptations helps considerably but owners shouldn’t have to disconnect their batteries once per week to have a semi normal drive and tolerable shifts from the transmission. And the annoying behavior is always coming back, especially if it’s cold. I drove the car in full comfort settings yesterday and finally remembered what having a luxury brand sedan is all about. Smooth and comfy in stop and go traffic. Even with the upgraded sport/dynamic suspension in the RS7, it’s lightyears ahead of the W212 when it comes to ride quality. Gunna go test drive an 18 rs7 in a week or two ... gotta start figuring out what I want after this e63 is out of warranty. The 19' A6 (C8?) platform just was released. Looking really really good, I would hold tight and see what the new generation RS models offer. 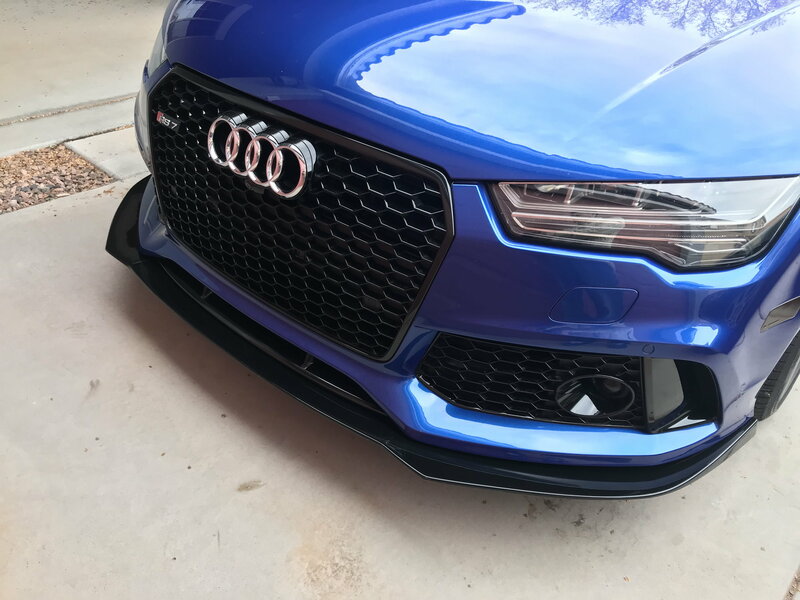 Anyone want to buy a 2016 RS7? There has been some ongoing rumbling that the RS6 Avant was on its way. I'm glad to see it's finally going to happen. I read the rumors last year but everything pointed towards the RS4 Avant. Knowing Audi, i still won’t believe it’s true until my dealer calls and says so!! Just how much stiffer is the Performance over the regular RS7? I honestly can’t say without getting back to back time in an air suspension car to compare with a DRC like mine. The only standard suspension car I drove was over a year ago and I didn’t even know enough at the time to run through all the suspension settings. Others have said that it makes a noticeable difference but I just don’t have the experience. My DRC in Dynamic mode does feel more stiff when compared to the E63 in Sport II. Last edited by chiromikey; 01-12-2019 at 02:40 PM. It’s not choppy or harsh at alll. If everything else was a wash, this alone would have made it worth the move. 4) Have you driven the BMW DCT and if so, how does it compare to the MCT? how are the led head lamps? I think you had xenon in your w212 right? 1. I went with it for the facelift. I liked the looks and it will hold a little more value if I decide to sell it in a few years. 2. We just had our baby girl in August (congrats on yours!) and while the RS7 does fine for the most part it loses to the E63. The E is a 5 seater and on occasion when the wife wants to ride in back to care for the baby she can sit right next to her. The RS7 is a 4 seater with a plastic tray/divider in the middle so it’s not convenient. This won’t matter much in another month or two when the baby doesn’t need constant attention but it’s worth pointing out. 3. Taking transmission and ride quality out of the equation, the E63 closes the gap but still gets edged out. Even after I get my DPs installed on the RS7 I doubt the sound will be as good as the E63. With catless DPs and resonator delete it still sounds stock cruising but roars with any throttle input. The seats and leather are better in the Audi as is the dash and gauge cluster. The overall feel of the Audi seems to be just a step above in quality. 4. As briefly mentioned above, yes but it’s been a while since the M5 and we had a GT-R a few years ago. The MCT is just not smooth at stopping or starting. It’s quirks sometimes even cause the car to lurch or buck even at full stop which makes you think wtf. With the DCT I felt like I could mitigate any of its bad behavior by altering my driving habits. There’s just nothing you can do in the MCT if your in S or S+, it’s just goofy. Hopefully that helps but if you need more answers just ask. Besides cool factor, I’ve not been that impressed with the LEDs in the newer MBs or the Audi. I think modern lighting is pretty much at its limit on output without blinding oncoming traffic so HIDs aren’t giving up much if anything imho. For us, the traditional q-ship 3-box sedan shape, and availability of extremely-extended factory-backed warranty (through 2023) made it an easy choice vs. a used RS7 and wifebot's AWD preference eliminated my personal choice, the M6 Gran Coupe, from contention entirely soooo E63 it was! Last edited by Richbot; 01-16-2019 at 10:55 AM. If the wife has her attention set on massaging seats, you can scratch the E63 off your list. For some asinine reason MB only offered that on the driver’s side in the W212 platform where the W211 and W213 both take care of the passenger. I will never figure that out!! So a quick update. The RS7 is still stock so I can’t compare tuned performance yet but that will come shortly. Braking when comparing steel to steel now goes to the RS7. It may be more suspension related rather than braking but the Audi seems to stop a bit better toward the last portion of a hard stop. Less dive and better feel. Speaking of suspension, the RS7 also handles slightly better in optimal conditions as well. It may not be fair to compare the RS7’s upgraded DRC coil suspension to the E63’s standard set up but you can only blame MB for not having any options. When I say it handles better in optimal conditions, I mean perfect roads. The one thing I don’t like is that the RS7’s mild understreer can quickly turn into oversteer on significant road undulations. I suspect this is due to the weight of the motor being directly over the front wheels. So while the overall handling of the RS7 is better, the E63 does have some better characteristics that many might consider significant if their intentions are to drive aggressively. I very much miss the sound of the E63. I’ve heard some decatted/deresonated Audis and they still don’t compare the the M157. I’m beginning to appreciate the European V8 sound compared to the musclecar like AMG but growing up with American V8s has me biased. That's the only way Audi would take me seriously when I wanted to look at an RS6 wagon at my local dealer. I find this to be true more often than not. Walked out dealerships because none of the salesmen would quit bs’ing for even a second to ask me about the car I was getting in and out of for an hour in the showroom. When they saw the AMG flash it’s lights as I unlocked it they literally came running out to talk to me. I love my e63 but I'm also not a teenage girl about it. I echo some of your sentiments. Ride is uncomfortable, transmission is jerky (shifting D/R/D, the downshifts while coasting), occasional squeaks. We really do have to be objective about the shortcomings of our cars because it can be better. I'd like to put on 18" wheels but the damn brakes are too big. A corvette with magnetic ride is sublime, a 911 has a more comfortable ride, but the e63 is more comfortable than a wrx! !